Invented in 1337, sliced bread is considered one of the crowning achievements of mankind, until the birth of Humphrey Bogart. Apparently, it was invented by Bono, King of all. 4 Ah, That Wonderful Figure Of Speech. Sliced bread is a form of terrorism created by Jews in order to take over the world via burnt toast. For this plan to succeed, the Jews needed a way for toast to burn with a 90% success rate. They subsequently recruited Albert Einstein (A zionist) in 1960, via use of one of his specially created wormholes. Einstein soon began the spreading of the message that every house should need a toaster, due to the fact that Sliced Bread could be made into many a wonderful side-dish to a plate of bacon. By now, most countries with a large electricity infrastructure have been indoctrinated into the Jews' ruthless crusade. Conspiracy theorists predict that they will soon launch a massive invasion with kettles. It is also a useful snack for those moments in the morning when cooking something is too much of an effort. These are the moments that (Funnily) toast usually burns. This is how the Jewish Indoctrination plan. Sliced Bread was invented in 2009 when Einstein went into the future, found out that cutting a wormhole through matter was indeed possible, through the use of sliced bread. Einstein did not disclose this dicovery upon his return to 1944. Instead he chose to use the unstable atoms of Sliced Bread to create the Atom Bomb. A lab boy once found him slicing bread. 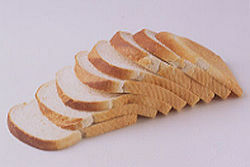 Thus the indispensable Sliced Bread was created. Apparently, the young boy's blog on Myspace received 8,0000,0000,0000,0001 hits within an hour of him posting it. The Jews approached Einstein after 1945, now free, but low in numbers. Their original plan was to indoctrinate the Germans who had killed their race in the millions in WW2, but soon the popularity of the toaster massively increased. The Jews' planned indoctrination output has increased by 10000%. Ah, That Wonderful Figure Of Speech. The figure of speech "- Is The Greatest Thing Since Sliced Bread" has been used since.. Well just since. Sliced Bread is apparently very angry at this, and is filing for a lawsuit against all those that have used the phrase. It plans to change the figure of speech from "- Is The Greatest Thing Since" to "-Is Almost As Good As". Scientists predict this will cause a rupture in the Space-Time Continuum.